While going through all the different options available for our new caravan, up popped the question on fridge type. Should we choose a Compressor Caravan Fridge or 3-way Caravan Fridge?? This article is our opinion only, but explains why we chose a Compressor Caravan Fridge. It is based on our experiences with the fridges in the three caravans that we have travelled in over the 12 months prior to building ours and the 20+ year old Engel compressor fridge that is in the back of our BT50. We have used three different 3-way fridges. The first was about 7 years old, the next was about 4 years old and the last was brand new and fully automatic. 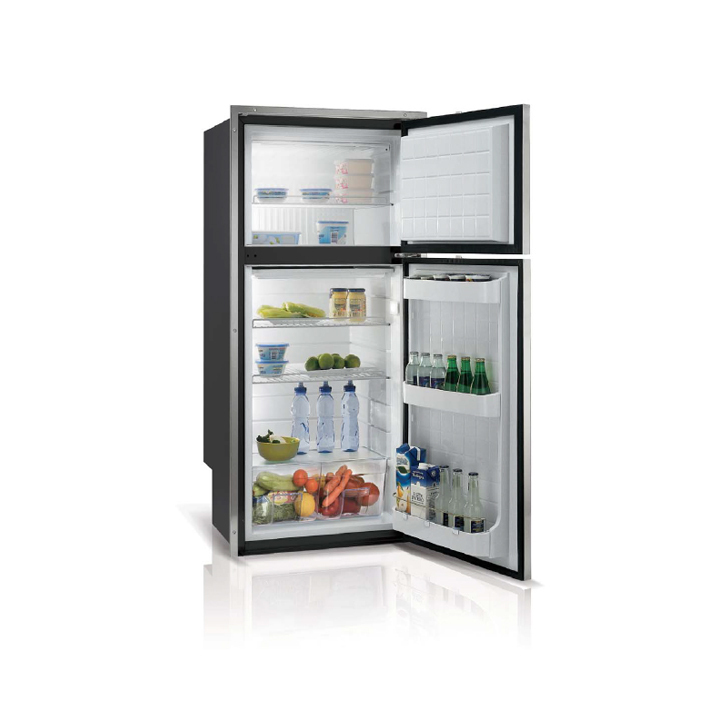 The major advantage of a 3-way fridge is the absolute convenience of 3 different power sources. The later model 3-ways have an automatic feature as well. If you select the auto mode your fridge will determine the best power source. Being an absorption fridge (no compressor) they are very quiet as well. The biggest problem with the fridges that we had was the inconsistencies of the fridges between power sources. One worked fine on gas but was hopeless on 12v and average on 240v. Another was average on 12v but hopeless on gas and 240v. We need the fridge to be a fridge all the time. We do not want to worry about whether the chicken in the freezer is still frozen, or if the milk for tomorrows breakfast will be ok.
run the fridge for at least 12 hrs before use. At no time were these fridges over filled or had the cooling fins crowded. Melissa and I gave the fridges the best possible running conditions we could but they still were not capable enough to stop us worrying about their performance. We have no way of cooling foods before they are put in the fridge when we are on the road. That’s the fridges job and keeping the inside of the van cool while travelling in Australia is not really possible most of the year. We really need the fridge to perform like the fridge in our house. I realise that this is not really possible as the fridge in our house has the best operating conditions for it to operate in. But the only way we can get close is with a compressor fridge in the van. SO A COMPRESSOR CARAVAN FRIDGE IT IS! The only real issue that we can see is the “compressor noise” at night time. We have both travelled in trucks and cars with compressor fridges for many years and the noise from the compressor has never worried either of us. So what do we have to change in the van to successfully run a compressor fridge and what brand do we buy? We looked at what the other major van manufacturers were running and listened to what other travellers and dealers recommended. We are installing a Vitirfrigo 230 litre compressor fridge in our new caravan. There is a 230 litre Vitrifrigo Fridge being installed in our van with a current draw of about 4.4amps. This is a 12 volt DC only powered fridge. There is also a power hungry 42 litre, 20+ year old Engel in the 4WD, so we need to ensure we have plenty of power stored for when we are off grid. We have 2 x 105ah batteries fitted to the van with 3 x 150w solar panels on the roof. We have a portable 160w panel, and a 110w panel on the roof of the BT. There are also 2 x 115ah batteries in the tub of the BT that can connect to the van. 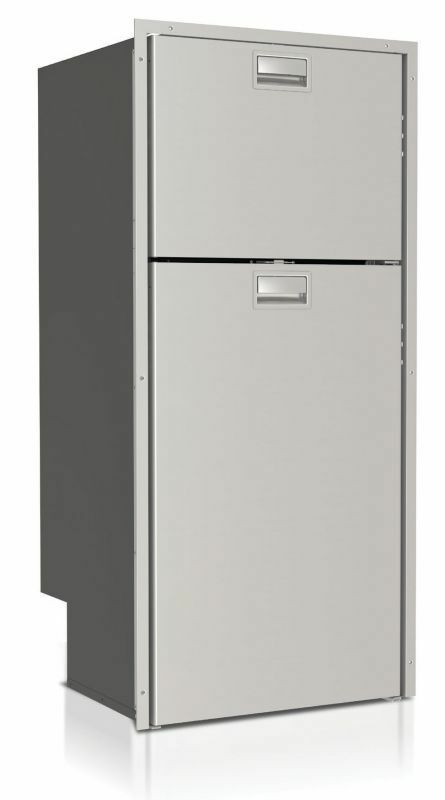 This Vitrifrigo 230 litre compressor fridge should keep all our food (and beer) nice and cold. So to power our two fridges we have well over 400ah of battery storage and about 720w of solar panels if they are all in the sun. That should be enough. We also have a 140amp CTek battery management system in the BT so I could start the car if needed, but I don’t think I will need to. And what happens when we plug into 240v power wherever we are? The fridge still runs off the batteries in the van while the 240v supply switches the battery charger on to trickle charge the batteries. Stay Tuned and we will let you know how our Compressor Caravan Fridge goes. Great article, I have a 3 way fridge and the cooling unit at the back has been replaced twice (by manufacturer) and each time the fridge can’t handle Australian summer, for me a 60 L cooler worked better with ice. We will let you know what we think of ours when we get it. We’re sure it’s the way to go.